I bought this moisturizer at Korea. I don't really remember the price sebab masa beli tu, I main ambil je semua yang I nak.... But I think it was around RM60+-. 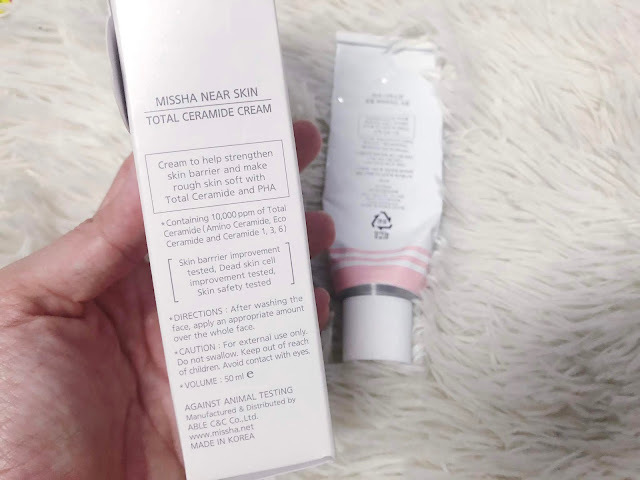 Missha's Near Skin Total Ceramide Cream is specially formulated to repair and strenghten the protective moisture barrier of the skin. 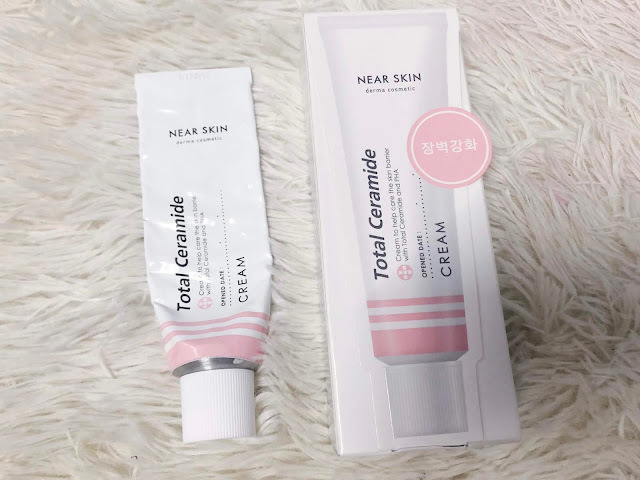 The protective layer of the skin mainly consists of ceramides, a group of fat-soluble molecules that prevent water loss and form a barrier against the entry of bacteria. As we age, and due to extreme weathers, our skin loses ceramides, which results in the disruption of the protective moisture barrier. This in turn leads to dry skin with poor resilience that easily damages. Missha's Total Ceramide Cream contains different types of essential ceramides that repair the skin's protective barrier: amino ceramide, eco ceramide, en ceramides 1,3, and 6. It's also formulated with hypoallergenic PHA exfoliant, a milder version of AHAs, to remove dry, dead skin cells and brighten the skin. Perfect for dry skin that easily damages. 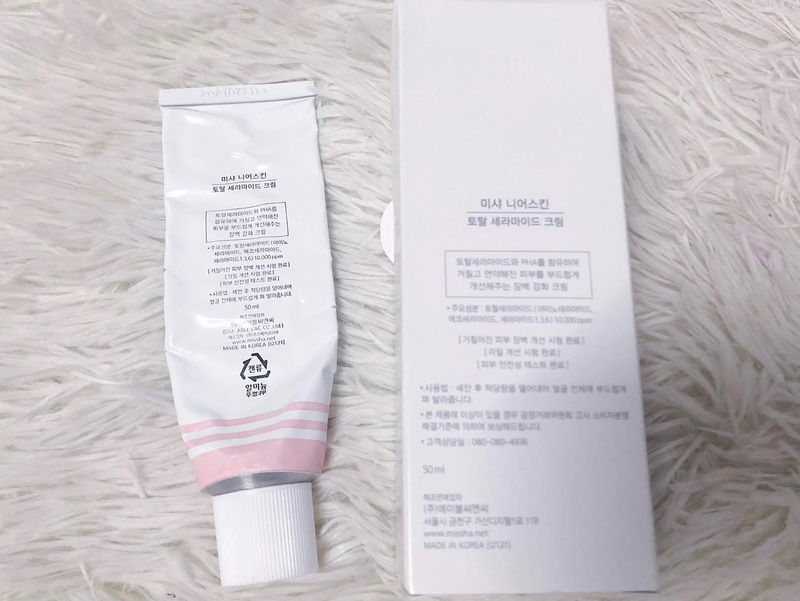 50ml white metal tube with white plastic screw-on cap. 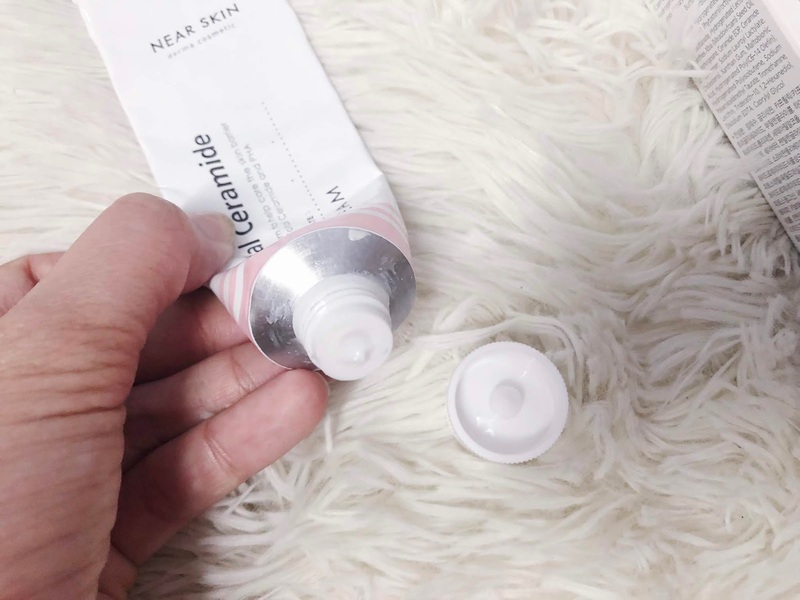 I love tube moisturizer sebab tak payah nak celup tangan kalau dalam jar. 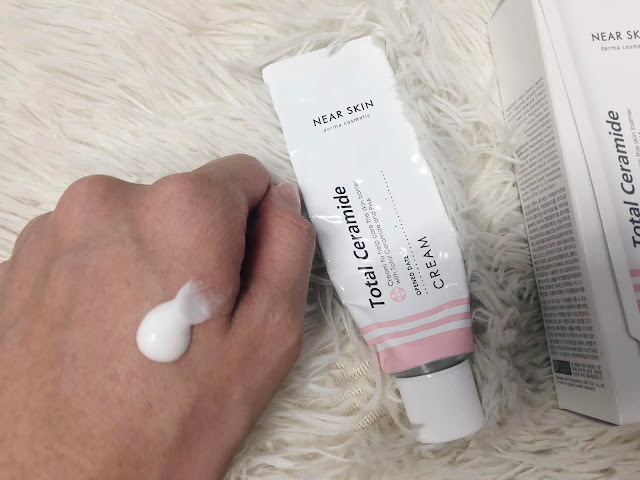 One of the most important criteria of a good moisturizer for me, kena dalam tube. And the design is also very beautiful for me. Pink? Yes please! However sebab dia metal, makin nak habis, makin susah nak keluarkan dia. Ada yang gunting je untuk habiskan sampai sisa sisa yang terakhir. I tak buat sebab sayang bekas dia so I picit je lah sampai habis. No noticeable scent that I notice. The texture is like a light cream texture, that doesn't make my skin feels greasy or sticky. It absorbs nicely, giving a dewy finish. This product is alcohol free, paraben free, fragrance free and silicone free. 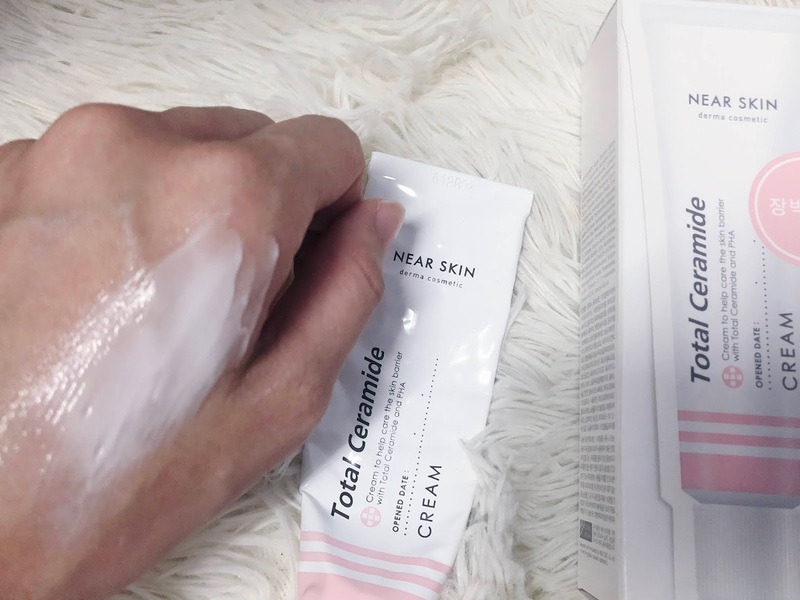 Based on skincarisma, there are 4 ingredients that may clog your pores which are Butylene Glycol, Cetearyl Alcohol, Hydrogenated Vegetable Oil and Hydrogenated Polyisobutene. However, it totally depends on your own skin. For me, it's okay. 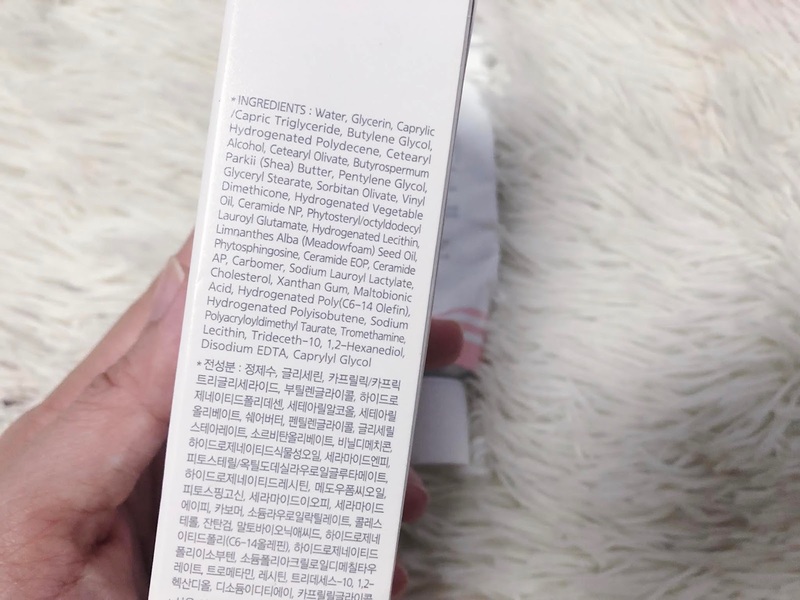 And if you have fungal acne, there are some ingredients that may not be suitable for you such as Cetearyl Olivate, Shea Butter, Glyceryl Stearate, Sorbitan Olivate and Meadowfoam Seed Oil. I really like how the texture absorbs nicely into my skin and give a dewy finish. It's not tacky or sticky at all. Tak ada rasa melekit or heavy lepas guna. I really like the texture and I think it is really suitable for dry or normal skin. It doesn't give any irritation and pakai rasa selesa je for the whole day. No redness or tingling feeling although it contains PHA (Maltobionic Acid) which is an exfoliating acid tapi lagi gentle compared to AHA. 2. It's also formulated with hypoallergenic PHA exfoliant, a milder version of AHAs, to remove dry, dead skin cells and brighten the skin. Perfect for dry skin that easily damages? I didn't notice any obvious brightening effect, maybe ada tapi tak perasan sangat. Bottom line, this moisturizer is just nice for my skin type, absorbs nicely and makes my skin feels comfortable. Dry/normal skin. I don't think it's enough for very dry skin or oilier skin type.